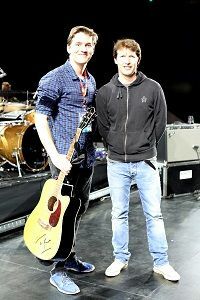 Lucky Harrow pupils had the opportunity to meet James Blunt on Wednesday, 4th April, when they were invited to watch James and his band do their sound check before their Shanghai concert at the Mercedes-Benz Arena, with songs such as Don’t Give Me Those Eyes, Wisemen and So Long Jimmy. They were then invited on stage and James introduced them to the band, and answered their questions with his trademark good humour. 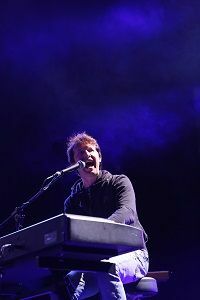 James Blunt is an Old Harrovian, having attended Harrow School UK before going on to Bristol University. 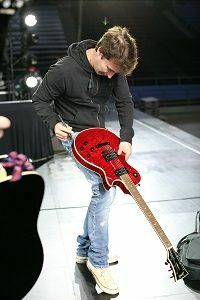 He was first introduced to the electric guitar aged 14 at the school by a fellow pupil. The pupils presented James with a Harrow Shanghai boater, which he was delighted to receive, admitting that he was a collector of hats and no longer had his straw hat from his schooldays at Harrow. He reminisced with the Harrow pupils about his time at Harrow, recalling how he performed his first solo when he sang Good King Wenceslas for the school at the Royal Albert Hall. He was a member of various school musical groups and remembers singing the Harrow songs, a number of which are also performed at Harrow Shanghai. His musical influences in those days were Fleetwood Mac, David Bowie and, above all, Elton John. 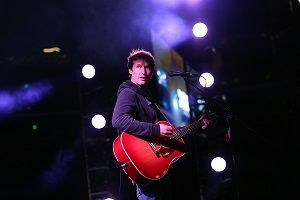 During an impromptu question-and-answer session, James Blunt fielded questions on a number of topics. Jamie Cook (Year 12) asked which James wrote first: the music or the lyrics? He replied there were no rules in songwriting, sometimes lyrics and sometimes the music came first. But, he continued, “the lyrics are in many ways the hardest part to write as you have to be something of a poet. But unlike a poet, you then have the music to help bring the words to life and to support them. It is important to be genuine and honest and to sing from your heart.” His final advice for aspiring singer-songwriters was to get a manager before trying to get a record deal! Jamie Cook (Year 12) was lucky enough to play one of the songs he has written, Don’t You Give Up On Love, for James Blunt, who described the chorus as “awesome”, joking that it was just the sort of song Mumford & Sons might be interested in. He gave Jamie some very constructive feedback. 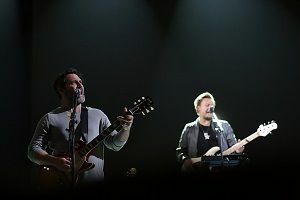 “It was a dream come true to meet an idol of mine, someone who I have listened to since I was little, and a once-in-a-lifetime experience being able to play for him” said Jamie afterwards. 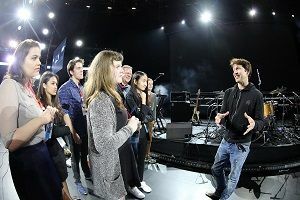 Meeting James Blunt was an amazing experience for the Harrow Shanghai pupils and both pupils and staff were struck by what a genuine, down-to-earth and lovely man he is. He was so very welcoming and generous with his time, with a really great sense of humour, as he has shown many times in the past with his Twitter repartee.